It's a revue! If I had known.......then this might have been a different post. 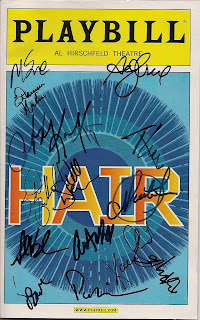 Well, I didn't see the movie nor have seen any previous production of Hair but I'm familiar with the songs from this musical. However, I've seen the cast's guest appearance in The Late Show with David Letterman plus the featured number at 2009 Tony Awards. Both performances were great and energetic. So it comes a bit disappointing when I finally saw the show. I didn't hate it but I wished I liked it more than I actually do because I know it's an iconic musical. I think I just got so over hyped that what I saw didn't live up to it. It wasn't because of the actors. In fact they were great........energetic and exuberant. It wasn't because of the music. For who wouldn't like Let The Sunshine In, Aquarius, Hair, Good Morning Starshine, I Believe in Love, Ain't Got No or Going Down? They're really great songs representative of an era. It wasn't because of the staging where the fourth wall was constantly crossed. Although I must admit it got a bit overstimulating at times and I didn't know where to look when the cast would go into the audience. It was because of the lack of narrative. I felt like the great songs were patched together.....but loosely patched by the lack of narrative. I wish I knew why Claude finally decided to join the army when clearly he was totally against the war. It would have made the ending resonate more for me. Speaking of the ending.......SPOILERS......the Tribe was celebrating and singing Let The Sunshine In, then they walk out from the stage to the 2 aisles in the orchestra as the volume of their singing decrescendos and reverberates in the theatre, a single spot light reveals Claude.......lying on the American flag on the floor......in his military regalia. It's a very powerful scene. Even made more moving when there was dead silence on the stage and from the audience. It is potent.......and that I did liked. Gavin Creel was very charismatic as Claude. Will Swenson was great as Berger while Caissie Levy (Sheila) and Allison Case (Crissy) have beautiful voices. Again, I have to say that the whole cast is very good, great voices and projects the value of celebrating life. It really does feel that there's a party every night at the Hirschfeld Theatre.